ST. PETERSBURG, Fla. (AP) Los Angeles Angels star Mike Trout missed Thursday’s 4-2 loss to the Tampa Bay Rays because of a bruised right wrist. 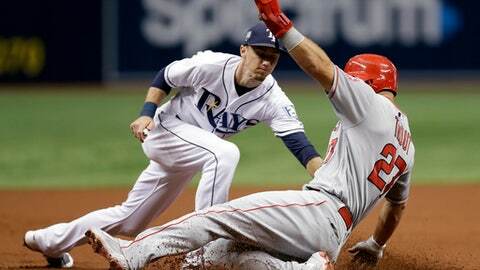 Trout got hurt while sliding during a stolen base attempt of third in the first inning of Wednesday night’s 7-2 defeat to the Rays. ”I didn’t really feel it at the plate, but on deck warming up I could feel it with the weight of the bat,” he said. Angels manager Mike Scoiscia said Trout underwent treatment Thursday’s game and was not available. Los Angeles opens a three-game series Friday night at Cleveland. ”We’ll take a look at it tomorrow and see what we have,” Scioscia said.